Found black and white photo (left side was double exposed), enlarged, cut out, colored with photo dyes, markers, pen, paint pen, and acrylics. 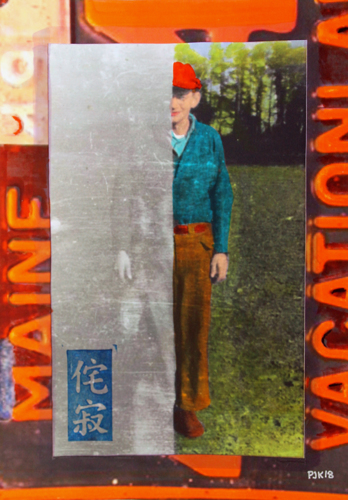 Collaged (glued) on 1949 Maine license plate (copy). Rubber stamp with wabi-sabi logo for my continuing wabi-sabi series. Essence of Maine and L.L. Bean-attired denizens.